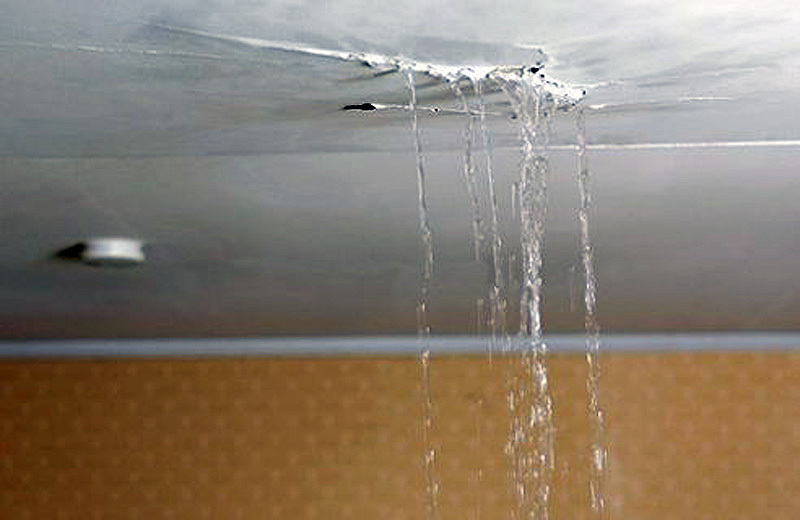 A leaky roof is the most common reason for water damage in a home. Leaky roofs are caused by missing shingles, clogged gutters, wind damage, storm damage, poor quality roof installation, and/or holes in the roof. If your roof is over 30 years old, you can expect to have these kinds of problems affecting it. Once these breaches occur, water is going to find its way into your home each time it rains, resulting in all sorts of interior damage. As for homeowner’s insurance, you may be covered for roof damage if a storm was the cause of it. However, the deductible is usually a high amount which means it would be cheaper to fix the roof damage yourself if the damage is minor. If your home has an attic, this will be the first place that damage will occur because it is directly under the roof. This will give you the chance to fix the leaky roof problem before the water gets down through your ceiling and into your living area. If you don’t have an attic, then the leak has already caused this to happen and you need to act fast. Water will be dripping from the ceiling when there is a leak. If you have plaster on your ceiling, it will start to expand and bubble up. If you have paint on your ceiling, it will turn a darker color. These are signs of damage from the water and you’ll want to stop the leak before the same thing happens to your walls too. Most people will put pots down on their flooring to catch the water that is leaking from the roof. You’ll want to prevent as much water as you can from soaking your wood floors, carpets, walls, furniture, and other possessions. It only takes 48 hours for mold and mildew to form after water has soaked these areas. If you don’t clean up the mold soon, it will spread to other areas of your home through the ventilation system. You will then have mold in the entire structure of your home and the mildew will be airborne through the HVAC system. This mold invasion will eventually affect the health of everyone living in your home. Also, let’s not forget that a leaky roof will become a fire hazard because of all the electrical appliances and devices that are in the home. If the water were to soak in through the walls and get onto the electrical wiring, it will likely cause a fire. Therefore, you want to take leaky roofs seriously and get them fixed as soon as you notice this happening. It is an investment that will protect your your entire home – and your health. Get Rid of Cigarette Smell in Your Home Can Water Damage Cause Mold?